Ohio’s County Departments of Job and Family Services are in the midst of significant changes to the way they administer public assistance programs – including food, cash and medical assistance. These programs are designed to help low-income families get back on their feet. In each of Ohio’s 88 counties, new technology and business processes are being introduced in order to modernize and, to some extent standardize, the way customers access these programs. This report provides a snapshot of some (though certainly not all) modernization practices happening across Ohio. The goal of this report is to draw attention to innovative work happening across the state, and to help community stakeholders and consumer advocates engage in local improvement efforts. This report focuses primarily on modernization practices related to Ohio’s largest programs – Medicaid, food assistance (called the Supplemental Nutrition Assistance Program, or SNAP) and cash assistance (Temporary Assistance for Needy Families, or TANF, known locally as Ohio Works First). In each of Ohio’s 88 counties, new technology and business processes are being introduced in order to modernize and, to some extent standardize, the way customers access these programs. Ohio is one of only 10 states that administers public assistance programs, including Medicaid, SNAP and TANF, through a “state-supervised, county-administered” system. The Ohio Department of Job and Family Services (ODJFS) and the Ohio Department of Medicaid (ODM) are the state agencies responsible for setting statewide policies and overseeing county compliance with federal and state regulations. County Departments of Job and Family Services (CDJFS) are responsible for the implementation of these programs, including making eligibility determinations, and have considerable flexibility to establish their own business processes and workflow models. Counties receive state funding, including federal funding passed down through ODJFS and ODM, to administer these programs at the local level. While counties are expected to contribute some local funds for specific programs, the vast majority of funding comes from state and federal appropriations. For at least the last decade (i.e. since the start of the Great Recession), Ohio’s county-administered public benefits system has been under pressure to “do more with less” as demand for services rose dramatically and state funding was sharply reduced. This pressure led many CDJFS leaders to modernize their business practices, as well as explore opportunities for collaboration and consolidation with other counties to increase efficiency and better serve customers. Even as the economy has improved and some caseloads have declined, CDJFS still face significant resource shortages and changing customer needs, requiring innovative, cross-county collaboration. The remainder of this report describes some of the latest state and county-led efforts to modernize the delivery of public benefit programs. Even as the economy has improved and some caseloads have declined, CDJFS still face significant resource shortages and changing customer needs, requiring innovative, cross-county collaboration. Coinciding with recession-driven changes to CDJFS operations came a “once-in-a-generation” modernization opportunity as a result of the passage of the Affordable Care Act (ACA) in 2011. The ACA required all states to overhaul their Medicaid eligibility systems to accommodate significant changes to policy and application processing, and provided significant federal resources to do so. To meet these new requirements, Ohio contracted with Accenture to replace its legacy eligibility system, known as CRIS-E, with a new, web-based eligibility platform for Medicaid, known as Ohio Benefits. The universal understanding at the time was that new Ohio Benefits system would eventually be modified to include additional public assistance programs, such as SNAP, TANF and Child Care Assistance. Ohio Benefits first launched in October 2013 to serve the Medicaid population, while counties continued to use CRIS-E to administer other public assistance programs. It is important to note that a federal “cost-allocation waiver” that supports the development of integrated eligibility and enrollment systems within a state is scheduled to permanently expire on December 31, 2018. This effectively means that the Ohio Benefits system development in 2019 and beyond may require more resources from the State of Ohio, since federal matching funds for system changes affecting non-Medicaid programs (such as SNAP, TANF or Child Care Assistance) will be reimbursed at the normal 50% federal rate, rather than the 90% rate permitted by the cost-allocation waiver. This is one of several reasons that Ohio’s policymakers should avoid making any significant policy changes to Ohio’s Medicaid, SNAP or TANF programs in 2018 – such as the introduction of a new Medicaid work requirement – that could jeopardize the successful rollout of Ohio Benefits to the remaining 83 counties. Ohio’s policymakers should avoid making any significant policy changes to Ohio’s Medicaid, SNAP or TANF programs in 2018 – such as the introduction of a new Medicaid work requirement – that could jeopardize the successful rollout of Ohio Benefits to the remaining 83 counties. At the time of this report’s publication, statewide rollout of Ohio Benefits for SNAP and TANF is expected to occur by late August 2018 although this timeline continues to be subject to change based on ongoing evaluation of pilot outcomes and federally-mandated system testing. See Figure 1 below for a consolidated project timeline. As noted above, CDJFS offices have managed separate eligibility systems for Medicaid (through Ohio Benefits) and SNAP/TANF (through CRIS-E) for more than four years. This long transition period has required innovative thinking from counties about how to leverage new business processes, staffing models and technology to increase operational efficiency and adapt to changing eligibility systems. In 2014, the Ohio Benefits Project Team launched County Shared Services (CSS), an initiative to expedite and standardize eligibility and enrollment processes for consumers across county lines, while preserving local decision-making and delivery of services. County participation in CSS is voluntary, and counties have the flexibility to decide how, and with which other counties, they wish to align processes and staffing resources to increase efficiencies. Some of the key benefits of County Shared Services, as articulated by the Ohio Benefits Project Team, are depicted in Figure 2. The core technology component of CSS is an Enterprise Call Center (1-844-640-OHIO) that allows Ohio residents to apply for, enroll in and renew Medicaid benefits over the phone. The Call Center is staffed by county caseworkers in their home offices that can share workloads across county lines (if desired) through the use of shared technology. In 2015, Collabor8 counties (Carroll, Delaware, Holmes, Hancock, Knox, Marion, Morrow, Sandusky and Wood) were the first to begin using the Enterprise Call Center, following by an additional 26 counties in 2016. 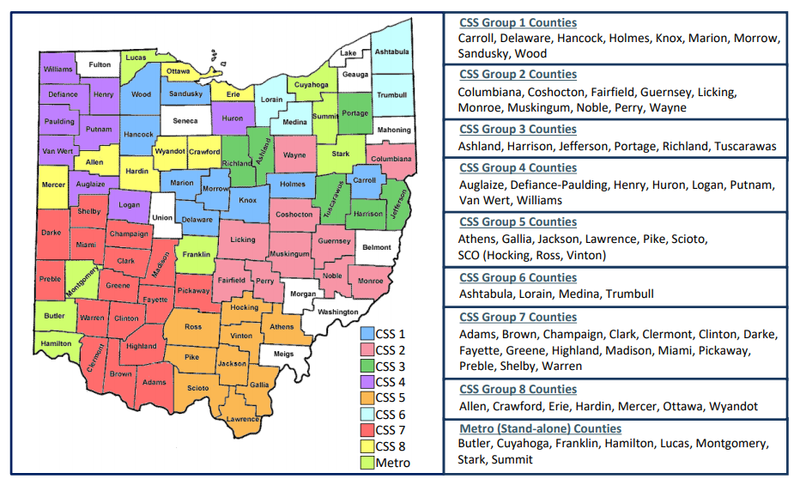 As of April 2018, 78 counties had committed to the CSS model through self-selected CSS groups and “stand alone” metro counties. See Figure 3 for a map of all committed counties to date. 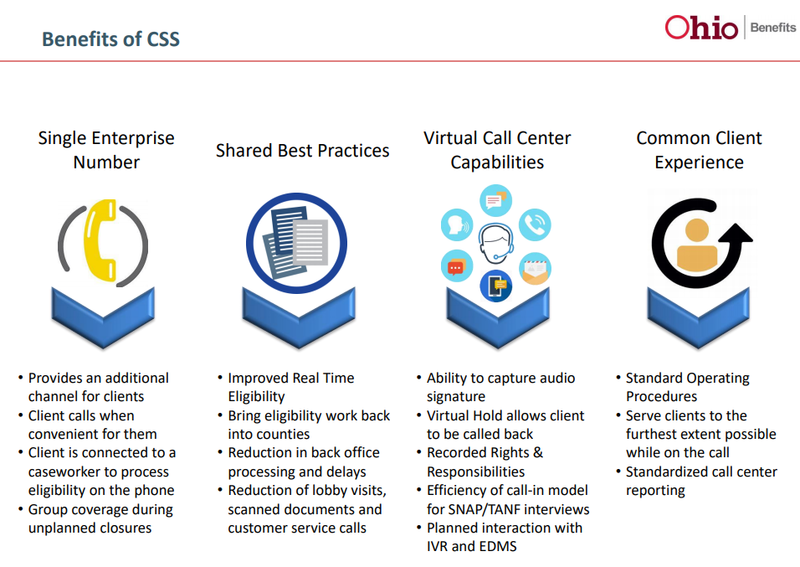 The CSS Enterprise Call Center has largely been considered a success, thanks to relatively short average wait times for consumers, “virtual hold” technology that allows customers to be called back (instead of wasting time on hold) when the wait is longer than 5 minutes and impressive “first-call resolution” rates. This suggests that more than half of Medicaid application and renewal requests are resolved in real-time by the county eligibility worker answering the phone. The CSS Enterprise Call Center has largely been considered a success, thanks to relatively short average wait times for consumers, “virtual hold” technology that allows customers to be called back when the wait is longer than 5 minutes and impressive “first-call resolution” rates. As the CSS model continues to expand and Ohio Benefits is implemented statewide, it would be helpful for ODJFS and ODM to publish data on the effects of both changes on standard performance measures. These measures would include things like application timeliness rates, application approvals, case closures and administrative hearing requests – to ensure JFS customers are benefiting from the changes. The success of the Enterprise Call Center for Medicaid led to requests from counties – particularly metro counties with more capacity to operate complex call centers – to expand the platform to include SNAP and TANF caseloads. Doing so would allow counties to improve both efficiency and customer service levels, since SNAP and TANF both require interviews with caseworkers which have historically been major barriers to enrollment. In June 2017, ODJFS authorized Stark County to pilot the inclusion of SNAP and TANF application and renewal processing through the Enterprise Call Center. According to Stark County, the pilot quickly proved to be an efficient way to allow customers to complete their required interview at a time that was convenient for them, leading to a higher percentage of real-time eligibility determinations and fewer procedural denials for missed interviews. In early March 2018, Summit and Hamilton Counties were also permitted to begin facilitating SNAP and TANF enrollment through the Enterprise Call Center. Lucas, Cuyahoga and Franklin Counties are expected to follow suit in mid-2018. As with the broad implementation of CSS and Ohio Benefits, ODJFS and/or participating counties should monitor and share quantitative data on how application timeliness, approval rates and other county performance metrics change over time to confirm that the new telephonic application process for SNAP and TANF is, in fact, improving both county efficiency and the customer experience. Call statistics from the Enterprise Call Center show that at approximately 24% of call volume relates to consumer requests for updates on their case status. While some of these calls require engagement with an eligibility worker, many could be addressed through an automated system available to JFS customers outside of business hours. With this goal in mind, the state began piloting an Interactive Voice Response (IVR) phone system for JFS customers in March 2018 in four counties (Franklin, Hamilton, Summit and Wood) and is expected to roll the system out to the remaining 84 counties in the coming months. During Phase 1 of the rollout, customers will be able enter their Social Security Number and date of birth to hear limited case status details in English or Spanish, including whether their Medicaid, SNAP and TANF cases are open, closed or pending, and any approved monthly benefit amount for SNAP and/or TANF. Customers who need additional information beyond case status will have the option to be routed directly to an eligibility worker when calling during business hours. Call statistics from the Enterprise Call Center show that at approximately 24% of call volume relates to consumer requests for updates on their case status. While some of these calls require engagement with an eligibility worker, many could be addressed through an automated system available to JFS customers outside of business hours. With this goal in mind, the state began piloting an Interactive Voice Response (IVR) phone system for JFS customers in March 2018 in four counties. Customers will also be able to sign up through the IVR system for text message notifications and reminders. For example, customers will be able to receive a text message when their pending application is approved or receive a text reminder about an upcoming renewal deadline. Future enhancements to the IVR are expected to include full integration with the state’s electronic document management system (described below) which will allow customers to receive more detailed information about pending cases, such as the type of verification information that must be submitted before an eligibility determination can be made. Historically, each CDJFS had its own system for managing documentation submitted by customers, such as birth certificates, paystubs and proof of expenses. State and county leaders recognized that the statewide transition to Ohio Benefits and County Shared Services platforms, that could facilitate seamless customer service across and between counties, would require a single, shareable system for storing and indexing customer documentation. Starting in late 2017 with the five Ohio Benefits pilot counties (Clark, Fairfield, Licking, Summit and Warren), the state began deploying the Statewide Electronic Document Management System (EDMS) which will allow all customer documents to be stored and viewed across county borders. The Statewide EDMS is expected to improve accuracy, timeliness and customer service levels. All counties are expected to begin using the statewide EDMS before the transition from CRIS-E to Ohio Benefits begins in July 2018. While the pace of change coming to CDJFS offices in 2018 may be dizzying for external stakeholders, the modernization efforts described above have the potential to significantly improve the customer experience for low-income individuals and families. To ensure this actually happens, community stakeholders and CDJFS leaders can work together to prepare their shared customers for the coming changes. To ensure vulnerable populations do not fall through the cracks, these partnerships can focus on customers facing unique challenges, such as homelessness, language barriers and unstable work histories. Host a CDJFS-led meeting with community stakeholders to ensure they have a basic understanding of the county’s plan to rollout process and technology changes in 2018, including how JFS customers and the broader public will be informed. For example, Cuyahoga County is currently convening a time-limited “modernization work group” to share detailed information with social service organizations that are directly involved in helping customers access JFS-administered benefits. Organize an open community forum in advance of a major rollout with a focus on changes that will directly impact current and future JFS customers. For example, Summit County hosted a Modernization Forum for nearly 100 community stakeholders in October 2017, shortly before the Ohio Benefits pilot launch. Feedback from the forum was overwhelmingly positive, with external partners reporting that they felt better prepared to help their low-income customers adapt to the new system. Establish communication channels between CDJFS leaders and local social service agencies for the days and weeks immediately following the implementation of new processes or technology. This kind of “feedback loop” allows external stakeholders to flag cases that appear to be falling through the cracks so that the CDJFS can quickly report verified glitches to state leaders for resolution. As described above, the next six months will be a critical time of preparation and testing for state and county leaders who administer public assistance programs in Ohio. The Ohio Benefits Project Team will continue to evaluate the success of the five-county pilot, particularly regarding how recently converted cases from CRIS-E are processed for renewal within Ohio Benefits. As the same time, the Project Team will be helping the 83 non-pilot counties to prepare for statewide rollout in July and August 2018 through bi-weekly readiness meetings, extensive policy and process training, and deployment of complementary technology, such as the Statewide Electronic Document Management System. CDJFS offices will need to stay on top of all readiness activities and make sure trainings are completed by all staff. As statewide rollout of Ohio Benefits approaches, CDJFS leaders and their trusted community partners will need to work together to share critical information with JFS customers and the broader public to minimize any confusion or disruption in benefits for vulnerable households. To stay updated on the progress of modernization efforts described above, join the Center for Community Solutions mailing list here. You can also request to be added to your county’s community partner listserv (which many counties maintain) so you are sure to receive any public information they share about new policy, process, or technology changes being introduced in the county. The principle of “sharing services” between neighboring jurisdictions is common across Ohio due to its many layers of local government. For example, “Ohio Shared Services” is a division of the Office of Management and Budget that provides consolidated business services to various government agencies. This report focuses only on the “County Shared Services” initiative led by the Ohio Benefits Project Team (comprised of DAS, ODJFS, ODM, and contracted vendors). County Shared Services Map, as of February 28, 2018, Available at http://ohiobenefitsproject.ohio.gov/Portals/0/PDFs/CSS_Map.PDF.pdf. Training materials for Metro Counties regarding the SNAP/TANF audio signature option are available at http://ohiobenefitsproject.ohio.gov/Portals/0/PDFs/CSS_Metro_Training_CRISE.pdf. Note that this required Ohio to adopt a federal policy option allowing “telephonic signatures” from SNAP applicants, which ODJFS officially did in February 2017. See Food Assistance Change Transmittal No. 59A, available at http://emanuals.jfs.ohio.gov/CashFoodAssist/FACM/FACT/FACT-59.stm. Phone conversation between report author and Stark County JFS administrators, January 2018. Summit County started with applications only (see https://www.summitdjfs.org/resources/apply-over-the-phone.html) while Hamilton County started with redeterminations only. Both are expected to add remaining functionality in the coming months. Medicaid LTC cases will not be handled through the IVR initially and will instead be routed to a live worker. Counties are also requesting taglines for additional languages to reach a broader base of JFS customers. See slides 73-76, of the In-Person County Readiness Meeting Deck, January 23, 2018, available at http://ohiobenefitsproject.ohio.gov/Portals/0/PDFs/January_23_2018_In-Person_ReadinessMeeting.pdf.